When a major emerging economy grows significantly you would expect job growth to follow closely. Sadly this is not the case for India. Between 2005 and 2012, India’s GDP growth was 54% but its net job growth was only 3%. There were only about 15 million net new jobs. This giant disconnect will worsen in the coming decade. Assuming 7-8% annual growth, 2025 will see GDP double. India will add over 80 million net new job seekers. But at current rates only 30 million net new jobs – mostly informal, and low-wage ones – will be created. 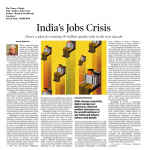 India should therefore prioritise policies that link GDP growth with job growth. Recent initiatives like ‘Startup India’ and ‘Skill India’ are crucial, but insufficient to achieve this vision. I’d like to propose six key strategies to fill the gap of 50 million jobs in the next 10 years, especially quality jobs that pay Rs 15,000 per month or more. Strategy 1: Appoint a National Jobs Adviser to the Prime Minister in the PMO. The Adviser would align job growth planning with economic planning; ensure integration of the multiple but siloed jobrelated policies across central ministries, as well as with the states; enable sharing of best practices between states, and provide a liaison between government and the private sector. Most importantly, the Adviser would monitor actual outcomes for quick mid-course policy corrections as needed. Strategy 2: Create a vast, integrated, national ecosystem for entrepreneurship education, mentoring and support. There is a myth that entrepreneurs are born, not created. I am a first generation entrepreneur, with no role model for entrepreneurship in my immediate or extended family. Entrepreneurship is about state of mind, and about having access to an ecosystem in which startup and growth ideas can be explored, not snuffed out; about education in the basics of startups and small business growth; about access to mentors, innovation funding, angel investors and other sources of capital and support. Over the last decade, Wadhwani Foundation National Entrepreneurship Network has established the National Entrepreneurship Network (WF-NEN) to provide entrepreneurship education at 500 colleges and universities, and training 2,000 faculty to teach 1,00,000 students annually. This needs to be made ubiquitous, with an expansion of at least 10 times. Strategy 3: Make it easy for startups. To actively contribute to India’s growth trajectory, we need a million startups with growth potential, with many of these outside the tech sector. ‘Startup India’ addresses many but not all the needs of entrepreneurs. Access to a national network of mentors and angel investors; and easy access to government procurement opportunities with simplified rules are essential. Policies that incentivise private investors to provide long-term equity and debt capital to startups are critical. Strategy 4: Enable growth in existing Small & Medium Enterprises (SMEs). While startups (especially digital startups) are glamorous, SMEs are the growth backbone of any nation and primary drivers of job growth. In India, 70% of the job growth during 2005-12 came from SMEs with 6 plus employees. Yet India’s policies favour micro-enterprises, defined as businesses with investment of less than Rs 25 lakh, with 1-6 employees typically, which do not drive job growth because they are neither able to invest in capital equipment nor be competitively productive. India’s archaic classifications of micro, small and medium businesses, based on invested capital, need to be scrapped and policies reimagined to encourage every business to grow to become a medium business, or larger, creating a more dynamic economy and more jobs. The government has defined 1,100 “modern industrial clusters” but these need to be segmented based on job growth potential and adequate infrastructure investments made accordingly. We need to establish SME ecosystems for high-value manufacturing, for example to support defence and railways. We need to attract long-term investors to invest in SMEs, not just startups. Strategy 5: Launch a major Startup & Small Business Innovation Initiative (SSBI). Some 40 years ago, the US launched ‘Small Business Innovation & Research’ initiative wherein various government departments allocate funding for innovation by SMEs, selected through an open, competitive process. This has helped create thousands of new companies and millions of new, quality jobs. We need a similar initiative in India, based of course on India’s priorities and needs. For instance, each of the major ministries could fund 500-1,000 innovation grants annually, of Rs 25 lakh to Rs 1 crore each, to SMEs selected through an open, competitive process managed by one or more major innovation-centric universities like the IITs. Strategy 6: Create a technology platform that enables startup and SME growth. This would provide the technology and knowledge infrastructure that powers all of the proposed startup and SME initiatives: enable digital/ mobile delivery of interactive curriculum and content to entrepreneurs, innovators; and connect them to mentors, angel investors and other key ecosystem participants. New business ideas, business plans, innovation grants, market data could all be easily accessed and exchanged on this platform; creating data for research and policy analysis. These are exciting times for India – with a once-in-a-lifetime opportunity to translate our demographic dividend into economic leadership. But it can only happen if India creates tens of millions of quality job opportunities and skills its youth to take advantage of them.